Green Lipped Mussels - this potent New Zealand whole food contains marine lipids, essential fatty acids, vitamins and minerals to help support inflammation management. MSM (Methylsulfonyl methane) - helps support the structure of connective tissues in your joints. Cost - Most supplement companies don’t want to compromise their bottom line by putting these expensive nutrients in their formulas. Delicate ingredients - Many of these nutrients can easily be destroyed by stomach acids long before they reach your joints and connective tissues. That’s why we use a special enteric-coating system to ensure these beneficial nutrients safely travel to your joints and deliver maximum efficacy. SAMe, Cetyl Myristoleate, Celery seed extract and Phellodendron bark extract (also known as “CorkTree”) – To support inflammation management and the immune system as well as manage aching joints. Despite the fact that our Total Balance, Green Lipped Mussel Powder and Omega 3/DHA products are excellent for supporting healthy inflammation management and the healthy function of your connective tissue and joints, many customers still need a ‘booster’ formulated to help people suffering from joint and connective tissue discomfort, Not Just Joints is just the boost you need. For maximum potency, Not Just Joints can be taken in conjunction with our Green Lipped Mussel Powder, Omega 3 / DHA Fish Oil and any version of Total Balance. You will find ingredients in Not Just Joints that are not usually included in other joint heath products... mainly because of cost and formulation challenges. Some examples are SAMe, Cetyl Myristoleate, Celery Extract and Cork Tree Extract. It is not only the cost of the ingredients that is a deterrent to other manufacturers but also the need to protect some of the ingredients as they pass through the stomach to the upper intestine. For example, we include SAMe (S-adenosylmethionine tosylate) in Not Just Joints. SAMe is a very important ingredient, but it can be rendered ineffective if released in the stomach. We use Colorcon Nutrateric II enteric coating to ensure that this is delivered successfully to the upper intestine for optimal absorption. Other Ingredients: Microcrystalline Cellulose, Dextrose, Enteric Coating (Purified Water, Ethylcellulose, Ammonium Hydroxide, Medium Chain Triglycerides, Oleic Acid, Sodium Carboxymethyl Cellulose, Talc, Polydextrose), Starch, Maltodexrin, Sodium Carboxymethyl Cellulose, Magnesium Stearate, Silicon Dioxide. For optimal results split into 2 doses per day: morning and later in the day. Take with or without food. Combines well with Green Lipped Mussel Powder and our Omega 3 Fish Oil products for the optimum protocol. 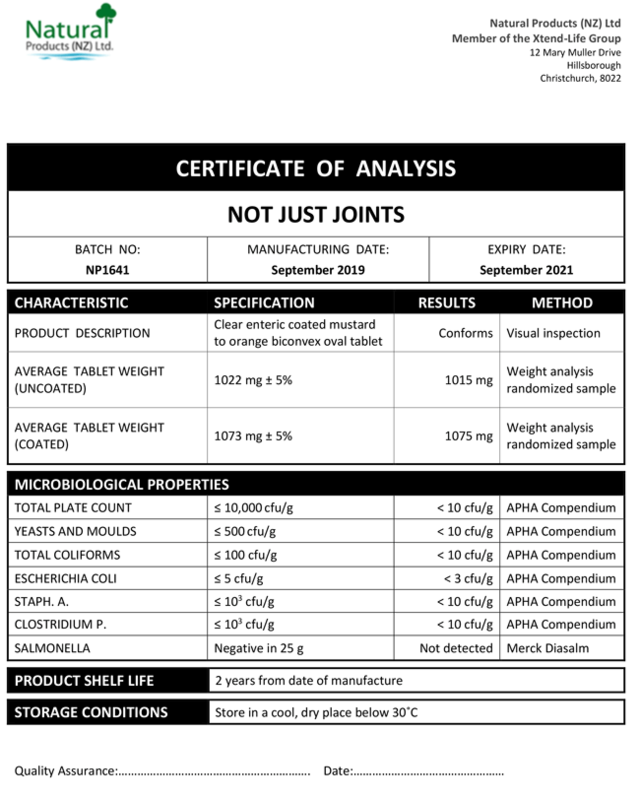 We have included below a copy of a typical Certificate of Analysis (CoA) for our Not Just Joints product. You will note that there are two columns which are headed 'Specification' and 'Results' respectively. The specifications are simply our minimum standard to which each batch of Xtend-Life Not Just Joints has to conform, otherwise we would not release it. The results are the actual results from the independent laboratory that did the testing. What are the main benefits of Not Just Joints? Not Just Joints may help the body to manage cartilage depletion and support cartilage function, mobility, healthy inflammation management and provide comfort to sore joints. It is an ideal product to help support arthritis and specifically may help to reduce pain that is experienced as part of this condition. What is the recommended dosage for Not Just Joints? If you have any questions, please contact our Customer Care Team. Combines well with Green Lipped Mussel Powder and Omega 3/DHA Fish Oil products for the optimum protocol. Can Not Just Joints help address pain experienced due to osteoarthritis or arthritis? Not Just Joints has been specifically formulated with specialized natural ingredients that have been used to support this type of pain. These ingredients include SAMe, Celery Seed extract and Cetyl Myristoleate. For more information please see the 'Ingredients' tab on the Not Just Joints page. How many bottles do I need to purchase to feel a difference and how long will it take Not Just Joints to work? To see the most rapid results we suggest you follow our 'recommended protocol' incorporating Not Just Joints, and one of our Omega 3/DHA Fish oil products. An even better option is to also incorporate Xtend-Life Total Balance as part of an 'Intensive' protocol for the best possible results. We would advise using Not Just Joints for a minimum of 2-3 months, before you can judge how it is working for you. As this is a naturally based product, it will work differently for every person and results may be gradual, although we would hope very beneficial given adequate time. The best results will also be obtained if taking this product in conjunction with a healthy diet and lifestyle. What are the ingredients in Not Just Joints which actually help with joints? Glucosamine to support healthy fluid levels around the joints. Chondroitin to help support cartilage damage. Green Lipped Mussels are included with marine essential fatty acids, vitamins and minerals to help manage inflammation. MSM is used to help support the structure of connective tissues in your joints. Phellodendron bark added for its analgesic and inflammation management properties. Can I take Not Just Joints and Green Lipped Mussel Powder at the same time for maximum joint support? You certainly may use Not Just Joints and Green Lipped Mussel Powder at the same time, this combination is especially good for those suffering from chronic and very painful conditions. Adding the Omega 3/QH Ultra fish oil to your regime will further enhance the benefits. Will Not Just Joints interfere with prescription medications? Many chemical and synthetic drugs may interfere with natural ingredients and vice versa. It is always recommended to consult your physician prior to adding any supplement to a medication regimen. There are a large number of ingredients in Not Just Joints, why is this? Xtend-Life's R & D team have researched numerous studies and trials to develop a unique and effective product. Not Just Joints has been formulated using ingredients designed to complement each other, enhancing the efficacy and providing optimum results. On their own, each ingredient will only be moderately effective in supporting the health and function of your joints and connective tissues. Working together however, in this carefully developed combination and dosage, these ingredients achieve the best results. The activity of each ingredient has been studied and formulated with other ingredients to maximize the benefits. Please click on the 'Ingredients' tab for more information. Are there any side effects associated with taking Not Just Joints? Not Just Joints is a natural product; therefore the potential for negative side effects is greatly reduced. It is very unlikely that there will be any negative effects. However, some people can still have reactions to particular ingredients and conflicts with prescription medications are possible. If you are using prescription medications, please consult with your doctor. Can I use Not Just Joints if I have an allergy to shellfish? Not Just Joints does contain green lipped mussel extract plus N-Acetyl D-Glucosamine, which is made from crustacean shells. This product will not be suitable for you if you suffer from such allergies.